This month, the Chairman of the Haworthia Society, Alan Rollason, will introduce us to the South African plantsman, artist and Haworthia expert Gerhard Marx. Alan will focus particularly on the Haworthia collection of Gerhard Marx – “with some of the most spectacular specimen plants ever”, he reckons. It is worth having a look at Gerhard Marx’s website, with some stunning examples of his botanical artworks (the image above is one we have linked to) and useful hints for pollinating and hybridizing Haworthias. 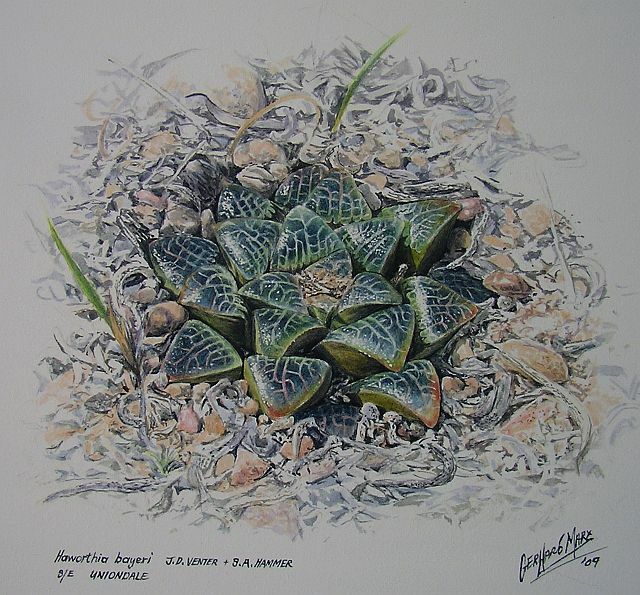 Gerhard Marx has a recently described Haworthia species named after him, and he is a regular contributer to the Haworthiad journal, published by the Haworthia Society.